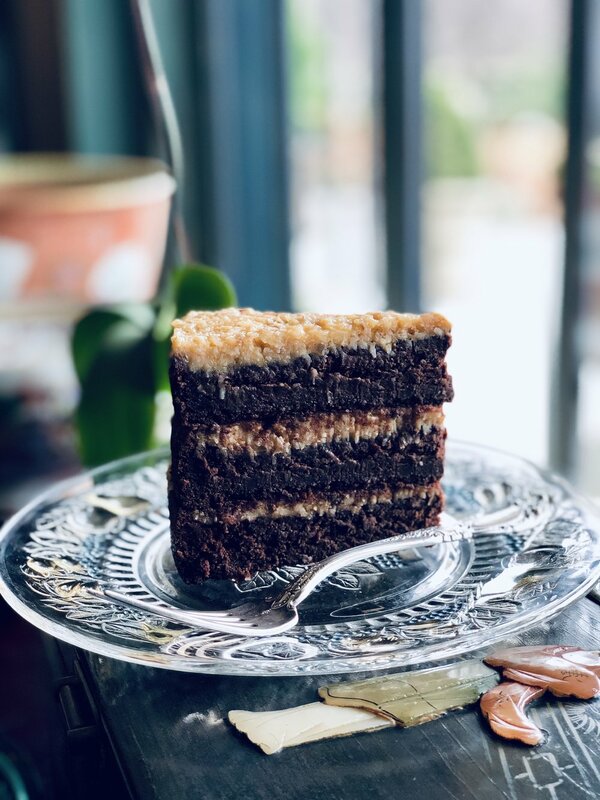 Not your traditional light and sweet German Chocolate cake, but a denser chocolaty version. I hope you like my take on this classic. Prepare three 8” round cake pans by buttering the insides, top to bottom. Cut out a parchment paper round to fit in the bottom of each cake pan. Butter the top of the paper. Set the pans aside and preheat the oven to 350 degrees. Using a sifter or a fine mesh strainer, combine the flour, cocoa, salt, nutmeg, baking powder, and baking soda. Place over a large bowl, give the mixture a few stirs with a spoon, then sift or shake the dry ingredients into the bowl. In your stand mixer with the paddle attachment or using a handheld mixer, Add the butter to a clean mixing bowl. Cream the butter until smooth. Add the brown sugar and granulated sugar, and whip that until smooth. One at a time add the eggs and mix in thoroughly before adding the next egg. Alternating between the dry sifted mixture, the buttermilk, and the coffee, begin adding each in batches to the creamed butter and sugar and mix to combine. Stop and scrape the bottom and sides of the bowl frequently to ensure everything is mixed in well. Once your two liquids and the dry ingredients are added, add the vanilla extract. Give it all a good mix and final scrape. You should have a smooth chocolaty cake batter. Yes, you may lick the beaters/paddle. Evenly divide the cake batter between the three prepared cake pans. Give the pans a gentle tap on the counter to release any air bubbles and make sure the batter in each pan is even and level. Place the cakes into the oven and bake approximately 30-35 minutes or until your best cake-tester draws out clean. Remove the cakes from the pan and allow to cool for 15 minutes. Flips the bakes out onto a cake rack and cool completely before icing. In a medium saucepan add the evaporated milk, sugar, and eggs, and whisk. Gently begin heating (“gently” means on medium-low heat) stirring constantly. Cook on the stove top until the mixture starts to thicken, about 5 minutes. Keep cooking and stirring the mixture and add the cubed butter a little at a time. Cook until the mixture is thick and the butter is added and melted in completely. Add the coconut and the toasted pecans. Fold into your mixture. Pour the icing into a shallow pan or on a baking sheet to allow it to cool off completely. This allows the frosting to cool faster. If you aren’t worried about “faster,” pour the icing into a clean bowl and save some dishwashing from step 4. Once cooled, scrape the icing into a clean bowl. Mix in the mini chocolate chips. If your frosting is not completely cooled, the chocolate chips will melt. See, you should have done step 3. Ice each of the cake layers evenly. I actually like a thicker layer of Icing on top of my German Chocolate Cake so will ice the layers thinner than what I frost the top layer with. Got it? But you do you. Slice and dig in when ready. Enjoy! !